Mirriam, from Malawi, is one of those people who makes you feel ashamed that you get annoyed about parking tickets or queues at the post office. She’s kept an amazingly positive attitude in the face of some devastating situations. When you meet her the first thing you notice is that she seems to radiate joy. Mirriam’s family has had some tough things to deal with. She’s a mother of three boys: Matteus, Blessings and John. When Blessings was four, he contracted cerebral malaria, which affected his development and caused physical disabilities that restricted his movement. Mirriam was, understandably, very worried for her sons and herself, but there was worse to come. One evening not long after he’d contracted malaria, Blessings was badly burned in a house fire. He survived, but had to have one of his legs amputated at the hip and was in hospital for six months. Mirriam slept on the concrete floor under his hospital bed every night. Mirriam with her two younger sons, Blessings and John. After the accident, Blessings required a wheelchair. 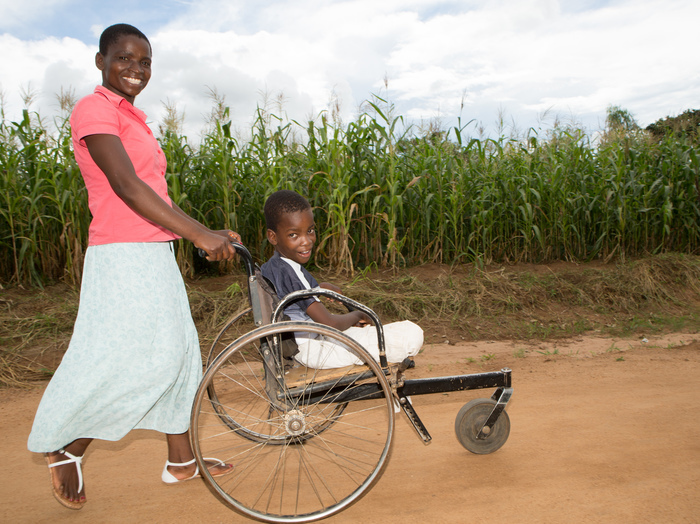 In Malawi, there’s very limited provision for children with disabilities; you can’t just request a wheelchair and be given one. And even if there is a wheelchair available, there’s no guarantee it’ll be the kind you need for your age or requirements. What Blessings got was a chair made of wood, with no tyres, that was pretty uncomfortable. 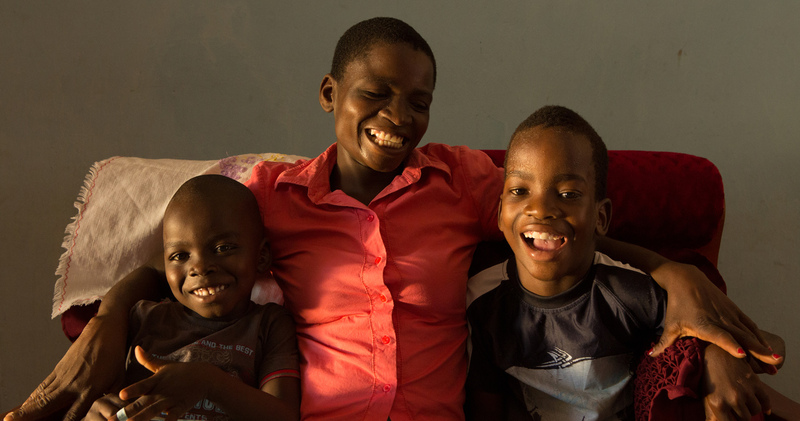 Mirriam had a lot to cope with: she was bringing up three boys, and had seen one of them go through a serious illness and a devastating accident that left doctors doubting he’d survive. Can you imagine how you’d handle all of that? And yet, when we met her, Mirriam was beaming nearly all the time. Where many parents in her situation would have felt like giving up in despair, Mirriam took action. She donated some of her own land and applied for grants to help set up the Dawn Centre, a residential school for children with disabilities. She wanted them to receive both education and physical therapy. Mirriam and her son Blessings. The Dawn Centre is a brilliant example of working in partnership. 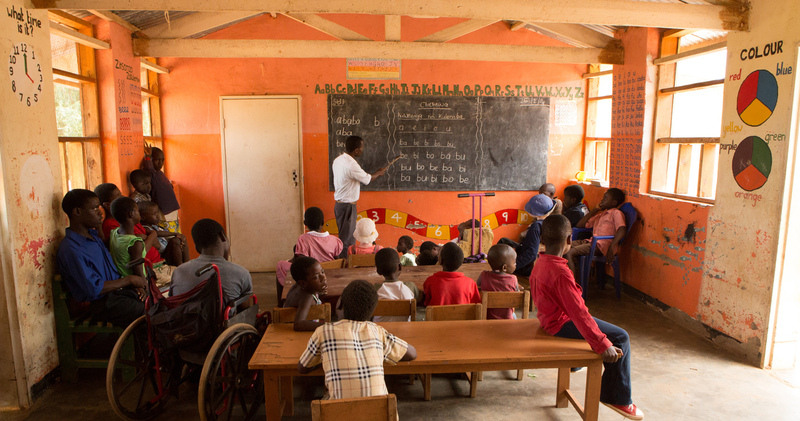 Sightsavers works with PODCAM (the Parents of Disabled Children Association of Malawi) to give training to staff and parents and implement inclusive education, so some of the children can make the transition to mainstream schools. Materials and labour to build the centre were paid for by AquAid, which continues to support the centre. But it’s Mirriam’s drive that has really made it all happen. She’s rallied and educated other parents in her community who have children with disabilities. She gets them involved in running the school and helps them understand that their children can benefit from education, therapy and inclusion, rather than being kept indoors and left unstimulated. A classroom at the Dawn Centre. 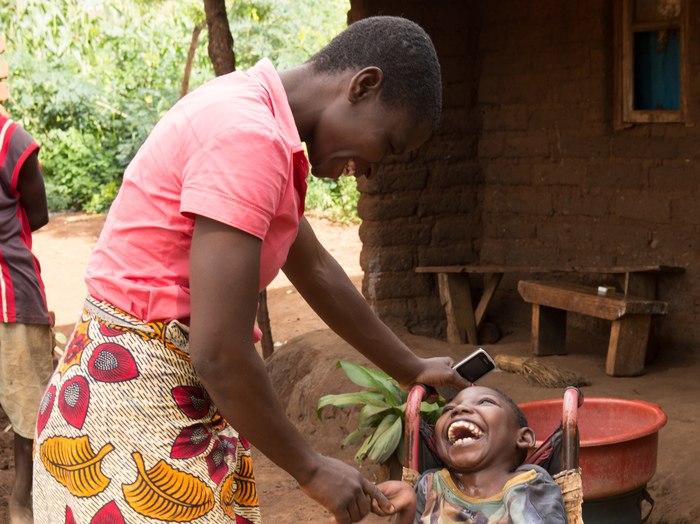 The centre helpes 77 children, including young people like Atola, who contracted yellow fever as a child and has been severely paralysed as a result. She receives physiotherapy from Mirriam, who brings the family soap, flour and other essentials when she visits. It also helps children like Emmanuel, who’s 13 and had cerebral malaria like Blessings. He benefits hugely from Mirriam’s visits, and everyone can see what a great relationship they have. As for Blessings: he’s thriving. He’s a happy, lively eight-year-old doing well at school, and his favourite subject is maths. Emmanuel Makanjira, 13, receives outreach physiotherapy from Mirriam. 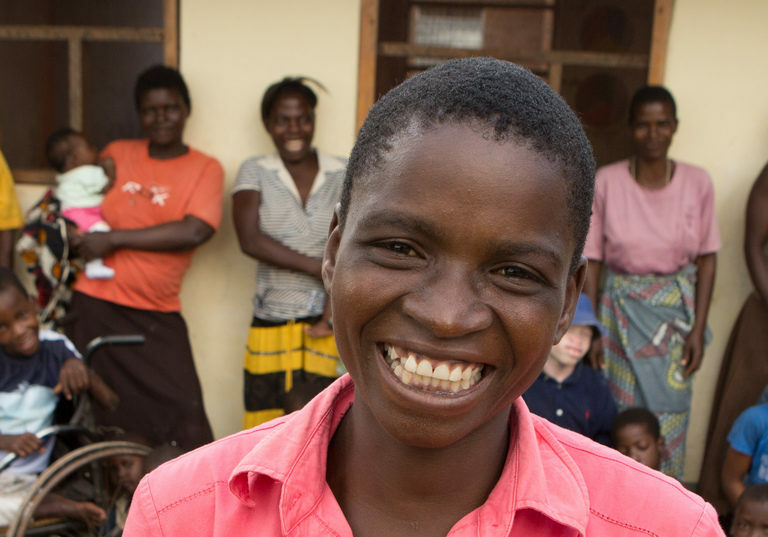 Like Mirriam, we think all children are worth educating and deserving of opportunities. That’s why our Put Us in the Picture campaign exists: to convince politicians that they need to make sure people with disabilities are included in the global fight against poverty. 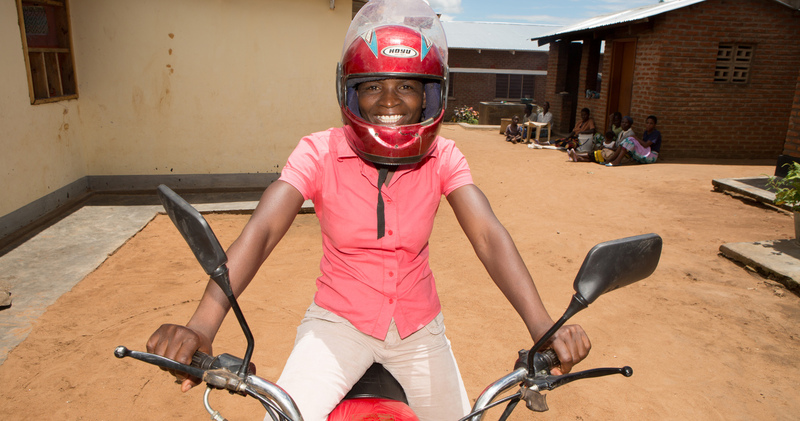 Miriam on the motorbike she uses for outreach work.